A military hero has been branded a cruel colonial governor, remembered as a "beast" on the slave island he ruled. 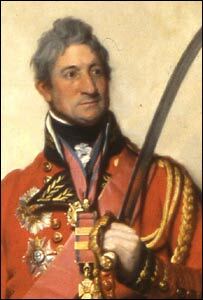 Sir Thomas Picton, from Haverfordwest, was the most senior officer to die at the Battle of Waterloo. But he had earlier been governor of Trinidad where an allegation of torture against him almost derailed his career. At a high-profile trial in London, he was accused of forcing 13-year-old Louisa Calderon to stand on a sharpened spike while suspended from the ceiling. This form of torture was dubbed "Pictoning" at the trial. He eventually cleared his name on appeal and went on to resume his military career. Today, his bust stands alongside that of Owain Glyndwr and other Welsh heroes at City Hall in Cardiff. Chris Delaney, of Carmarthen Museum, told a BBC Radio Wales programme marking the 200th anniversary of the abolition of the slave trade: "He is remembered more for his military prowess, his military skills and the fact that he actually died at Waterloo. "He was quite clearly a hero of Britain and if you look at biographies, this trial is a small stain on his character." But Trinidadian historians say they have uncovered the full brutality of Picton's rule in Trinidad. "He had a very bad reputation as a governor," civil rights campaigner Khafra Kambon told the programme. "He was extremely harsh in the kind of punishments he meted out. A magazine cartoon depicting the form of torture dubbed "Pictoning"
"There was a lot of terror associated with him. He was a very hard, unfeeling governor, he was regarded as a beast." The programme tells how he introduced tough slave codes, raising the number of lashes which could be given to a slave from 25 to 39. He also introduced a 9pm curfew which slaves would receive 25 lashes for breaking. Slaves had traditionally been given Saturdays off to grow food on their small plots or sell produce at market. Picton abolished this and fined owners who allowed it to continue. 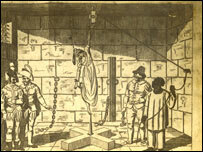 Executions and torture were common under Picton's regime said Mr Kambon. "You have to see the kinds of punishments that were meted out...the torture, the beheadings and the hangings. The laws were extremely harsh. The practice of slavery was extremely harsh," he added. "For minor offences - like if you stole some sugar - they would slit your nose. If you do it again they would cut off your ears," said Kambon. Slavery: The Welsh Connections is on BBC Radio Wales, 25 March and 1 April at 1330 GMT and both are repeated the following Monday at 1800 GMT. Wales and Slavery: The Untold Story is on BBC2 Wales on Thursday, 22 March at 1900 GMT.